« What Matters Most on This Election Day, 2016? 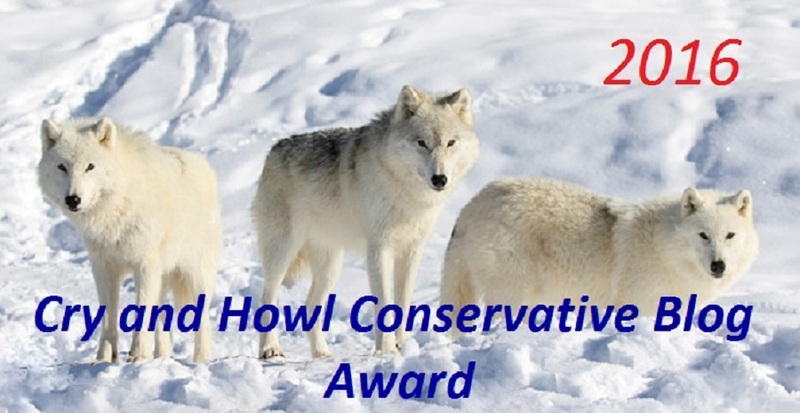 Back on October 30th, my dear blogging friend Steve over at Cry and Howl was so kind to include Talk Wisdom on his annual “Conservative Blog Award” list. I am truly humbled and I thank him so much for including my blog on the list! Several of the bloggers on the list have sent readers over to Talk Wisdom through re-posting the list on their blogs, so I wanted to return the favor. Congrats to all of the conservative bloggers on the list! My dear friend Denise is one of the first bloggers I “met” years ago when I ran my old site Stevex09. She’s a wonderful, passionate conservative blogger whose work is featured over at the Watcher of Weasels site among others. My hope is that someday I’ll get back out to the east coast and Rini and I will get to meet Denise. I’ll buy dinner and we’ll all have great fun. Prof X. is an old friend of mine. We first met quite a few years ago on the web-site Jib Jab. Back then it was a joke site, one where the members posted funny videos, word jokes, funny pictures, etc. It was a social site and everyone had their own page with what ever personal stuff you wanted to illustrate. I made a lot of friends there. Jib Jab finally shut down the joke section and transcended into a kind of greeting card site. It’s cool, but all the “Jib Jabbers” who participated left after the joke section folded. Prof X. is the owner of Partneringwitheagles site. A good friend and genuine conservative. Next up I think the Angry White Dude very much deserves any and all conservative awards and the humble C & H award goes without saying. I don’t know the gentleman who owns the blog site but he’s a conservative Texan. I’ve visited his site quite a few times and can always count on reading a witty, well thought out take on about everything that I support. And the fact that he’s a fellow Texan … well, that does up the score for AWD. Dan is a very talented conservative writer. On his ‘about’ page he has “contributed to Pajamas Media and Pajamas Tatler. In addition to my own blog, Dan Miller in Panama, I an an editor of Warsclerotic and contribute to China Daily Mail when I have something to write about North Korea.” Dan is a great guy to have on the conservative team! An awesome blog site which covers nearly every issue dear to conservatives and America loving people. The writer offers a down-to-earth, common sense take on issues that really need to be addressed in such ways, debunking the loony opinions of the left. I don’t think “Starvin” accurately describes Larry. This guy knows hunting, fishing and survival. Conservative and insightful into the shenanigans of those within our corrupt government. My very good friend Paulette is the Mad Jewess. She is a firebrand for sure! I’ve spoken with her on the phone several times and I can’t help but love her and her passion for America and her fierce anger for liberal Jews. Paulette is an extremely talented singer/performer/artist and a no-nonsense lady who is fed up with the outrageous attacks on white people by illegal immigrants and low-life black thugs … all which go un-reported by the media. I’m still hoping to pay her and her husband David a visit when Rini and I head out to the west coast. I don’t know the young lady who owns the blog site. I do know she is a patriotic American who stands conservatively on all the issues we’re concerned about. She visits C & H now and then and I’m always grateful for her comments. Christine Watson over at Talk Wisdom is a dear lady whose blogging friendship goes back … oh … about eight years, maybe more. She and I have experienced differences of opinions regarding Donald Trump’s run for president. Naturally, this has caused a division between us. Regardless of our opinions of Mr. Trump she is a staunch Christian conservative and her blog is an encouragement to all who visit. I count her as a close friend and love her as a sister in Christ. This list would not be complete without Talk Wisdom on it. Actually folks, the list is far from complete with the few I mentioned here. In reality, I’m tired and the non-participation of the “public” kind of clued me in that it’s really not a big deal. Having said all that, for those who accept the humble award, post it on your home page. Have a great Sunday! This entry was posted on November 10, 2016 at 2:58 pm and is filed under Cry and Howl blog award list. You can follow any responses to this entry through the RSS 2.0 feed. You can leave a response, or trackback from your own site. Thank you Christine! You’re the best!